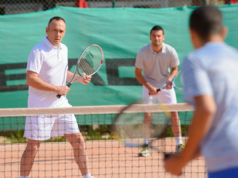 Whether preparing for tournament competition or simply warming up during a training session, most players begin with the customary “mini tennis” hitting in the service box. Recreational players, aspiring professionals and even WTA players all typically engage in this exercise before moving on to baseline hitting. But not ATP players. Why is this? What do they know that the rest don’t? Despite most people’s belief that hitting in the service box assists players with warm-up, coordination and movement, it is arguable that it actually has the opposite effect. It may just be that the professional athletes on the ATP tour have become acutely aware of this, in addition to their willingness to abolish cultural traditions that serve no obvious purpose. Once players pick up their racquets and walk on to court they should already be warm. If their pre-court warm-up was adequately performed, they should be sweating. Mini tennis could also be detrimental as it forces players to shorten their swings rather than lengthen them. Players have less time between sending and receiving the ball when positioned on the service line than they would if positioned on the baseline. Those who believe that this is the best way to start need to reconsider. 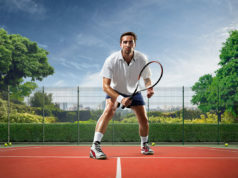 There is a reason why the great players such as Roger Federer, Novak Djokovic and Rafael Nadal don’t engage in this exercise, as it is not only a futile use of your precious practice time, but also is counterproductive. Begin your next practice with slow, rhythmic hitting from the baseline that allows for long fluid swings, relevant footwork patterns and an immediate focus on ball depth. 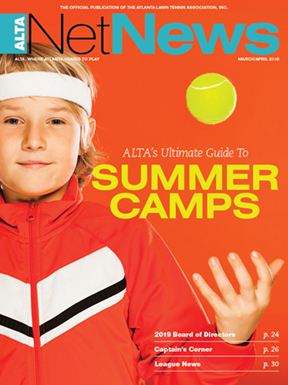 Targets – whether a cone, rope or even an item of clothing – act as visual aids when strategically placed to create distinct focal points and elicit highly purposeful shots. Targets provide players with instant feedback after every shot; this affords them the opportunity to self-adjust without constant intervention from a coach. Miss the target short and your next ball must be aimed longer, miss to the right and your next shot must be aimed more to the left. By simply creating an environment, you will be amazed at what you can achieve. Interestingly, targets and markers are not only useful when placed on your opponents’ side of the court, but also when placed on your own side as a way of dissecting the court and thereby dictating where your ensuing shot should be directed based on the position you received the ball. Using targets in this manner generates a succinct set of guidelines that optimize your percentages. Targets are an essential part of any training session as they provide margins, clarity and purposefulness in addition to removing the complex decision-making process that often produces unforced errors. Use “visual aids” enough during training sessions, and you will rapidly be able to “visualize” them on the match court. Similar to singles serving tactics, if you want to hold serve more often in doubles, then most serves in the deuce court (serving against a right-handed player) should be hit down the middle. 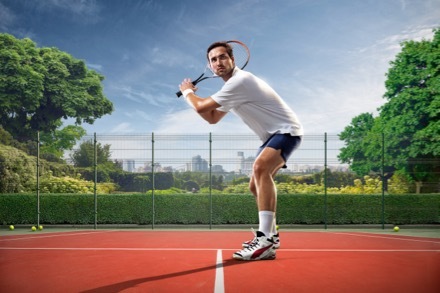 The amount of tennis court a doubles player has to cover is smaller than what a singles player has to cover, so you don’t want to increase the returner’s target area any more than you have to. Apart from serving to your opponent’s forehand strength, serving out wide forces the server’s partner to move over to cover a down-the-line passing shot and allows the returner to hit a short angle, cross-court winner. Serving down the middle, however, severely limits what type of return the returner can hit. In the deuce court, this is normally an “in play” backhand return cross court, an off-pace shot that dips down at the serve-and-volleyer’s feet or a lob over the net player’s head. 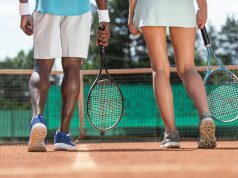 To prevent the return lob in the deuce court, the server needs to communicate with their partner on where the first and second serve is going and tell their partner to anticipate the lob. Serve placement can vary more in the ad court, depending on how weak the backhand is compared to the forehand. But even in the ad court where the returner has a stronger forehand, the return normally will be a forehand drive hit right back at the server who doesn’t have to move too much. Serve down the middle more, especially in the deuce court, and you will win many more service games.